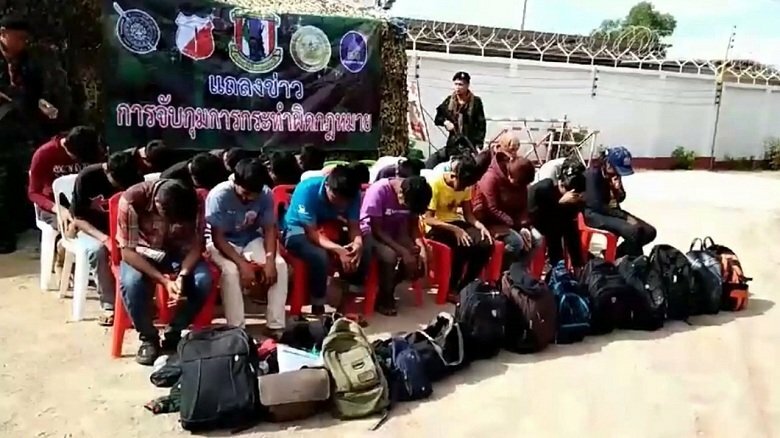 Police arrested 23 undocumented Myanmar migrants at the Thai-Malaysian border in Songkhla’s Sadao district on Monday morning. The 19 Myanmar men and four women were found by a team of troops and border patrol police. The migrants had been hiding at the border in Moo 7 village in Tambon Samnak Kham, waiting to sneak across the border into Malaysia. The authorities also took two Thai women found near the spot in for questioning. The two said they had been collecting edible plants and knew nothing about the group of the Myanmar people. The migrants told the authorities that they had sneaked into the country via the border in Ranong and travelled to the spot, where they had been waiting for a Malaysian man to take them for work in Malaysia. They said they had paid the man between 2,000 and 3,000 ringgit (Bt15,875-Bt23,815) for the cost of finding jobs for them in Malaysia. Where's Big Joke and his massive heavy duty vinyl banner and his media junkies? Opportunity lost? I miss him if I don't see him in the national news every 8 hours.